Discuss interesting gloves listed on eBay or other auction houses. Group effort this moth - want to see many different people posting ! A 1930's Spalding "Al Lopez" model catchers mitt sold for $179 on ebay. Mitt is in good condition, nice cloth patch on the back. The "American Mitten Co." crescent pad catchers mitt sold for $750. Nice Mitt! A crescent pad, full web glove sold for $1100 on ebay. Nice glove, wool interior, no manufacturer listed. An early, large size, grommet web catchers mitt sold for $145 on ebay. interesting buckle/keeper arrangement. Cloth patch was unfamiliar to me. A nice Wright & Ditson maroon 1" web glove sold for $187 on ebay. Last edited by mikesglove on September 10th, 2012, 4:12 am, edited 2 times in total. A 1940's Stall & Dean "Chas. Gehringer" model sold for $139 on ebay. Unique webbing and back panel design. Have also seen a buckle back and laced back version with different endorsers. Last edited by mikesglove on September 10th, 2012, 4:15 am, edited 1 time in total. This was an exciting glove to wonder about an try to win. I've got an old photo of Nap Lajoie with a mitt like this. Once again, I was the under-bidder.Wound up $407, which I think is a bargain. 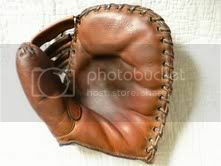 One of these days I'm going to add one of these early fielder's mitts to my collection. A Higgins "Don Gutteridge" model 1621 with box sold for $227 on ebay. The box isn't so great but the glove is stellar. Possibly top of the line in its day and made by Wilson. Triple tunnel web and diverted thumb seam. Last edited by mikesglove on September 18th, 2012, 12:42 pm, edited 2 times in total. A Marathon "Pat Collins" model catchers mitt sold for $161 on ebay. Beautiful leather, well taken care of. Nice logo stamp and endorsement in the pocket. Mitt possibly made by Stall & Dean. Needs a few more perimeter grommets squeezed in there however. 1930's Vandervoort brand "Gordon Slade" model glove sold for $89 on ebay. Interesting side lacing. Finger lacing indicates glove possibly made by KenWel. If anyone on our glove thread won the bid on the laced pinky glove and might later want to trade or sell it I would be interested. It is a funky glove. A scarce Bon Tober glove sold for $316 on ebay. Black leather and in super condition. A 'teens era Wilson catchers mitt sold for $46. Has the older style cloth patch with Thomas E. Wilson in an oval. Seems like a nice mitt with the patented wrist strap. Last edited by mikesglove on September 24th, 2012, 12:38 pm, edited 3 times in total. A 1930's KenWel "Alex Hooks" model basemitt sold for $68. Nice elongated style in overall good shape. A James Brine "Carl Mays" glove sold for $82. Has some condition issues. Possibly a Rawlings made glove, nice pinky lacing. A KenWel "Edd Roush" model glove sold for $475. Glove is in super shape. A circa 1925 Reach "Chic Galloway" model CG sold for $782 early in the month. Full web endorsed model. Condition is just killer. Withdrawn from ebay but would have garnered an interesting final price. A 1950's Rawlings "Mickey Mantle" MM4 glove with picture box, hang tag and original receipt. Top of the line 1940-50's Wilson "Ray Schalk" catchers mitt sold for $210 on ebay. Mitt is in excellent condition.